Two of our three play dates last week fell through because of sickness. 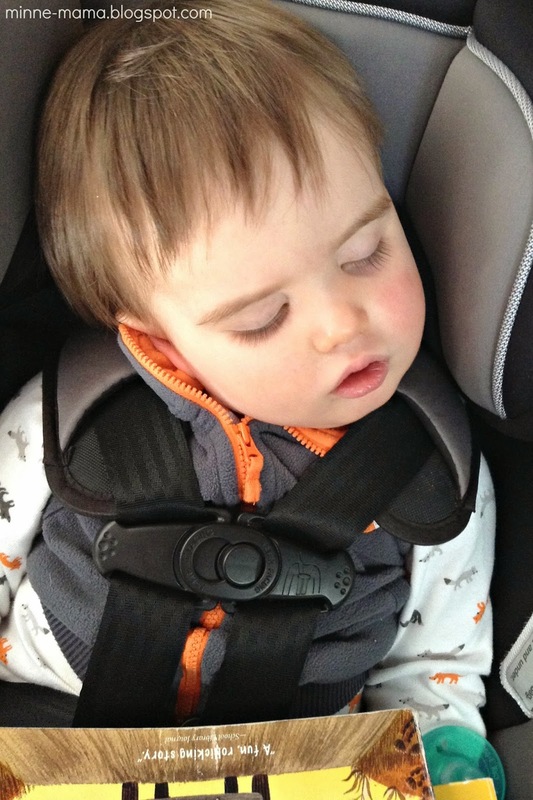 On Friday, Skyler's poor buddy had the flu and yesterday Skyler and I were on the way to a friend's house when I looked at him in the mirror, he had just fallen asleep, and I just knew he wasn't feeling well. I didn't want to get any of his little friends sick, so we turned around and went home. What made me most sad was when I lifted him out of the car he looked around and cried "Poppy!" because we had been talking all morning about going to Poppy's house. Two unopened books on his lap. Definitely something wrong! On a related note. Friday night we had a sleepover at my dad's house and it was without a doubt the worst night we have ever had, infancy included. He slept alright from about 7:00-1:00, though he was waking up crying almost every half hour, which never happens - Skyler is, and always has been, a super sleeper. I went into the room to go to sleep and he woke up screaming, obviously having a hard time breathing and because his soothie kept falling out from breathing through his mouth. I could hardly console him and he spent most of the night laying on my chest elevated, I am not sure how much he slept, but I didn't sleep at all. There were some good moments throughout the night, like when Skyler would lay his head down on my body and say "hug" while squishing in as close as he could get, or when I asked him if he wanted to go back in the crib or with mama and he said "Mama..." I said "You want to stay with mama?" "Yeah, mama." He was so upset and around 6:30am he let out a cry and my dad came in to take him to the couch to cuddle and when they walked out of the room I just bawled and then passed out until 8:30...it is the absolute worst feeling to know that your child is uncomfortable and doesn't feel well, trying everything you can to alleviate their sickness, and nothing works. It made it even worse trying to calm him quickly throughout the night, knowing that my family was sleeping (or not sleeping because of it) close by. I thought he was feeling better since he slept fine last night, and then today his sleep has been all crazy. But, I digress. We did this really fun project before our sleepover on Friday. In October, Skyler and I started going to a local library for story time on Wednesday mornings. We have only gone to the one, in my hometown, but we love it so much I am thinking of trying the one in our current city on another day as well. It is one of the greatest activities during the long winter. It is free, and the one we are attending now you sign up for the entire month, so it is a great way to fill some time every week. There are four stories read, songs and rhymes, and then about fifteen minutes of play time. 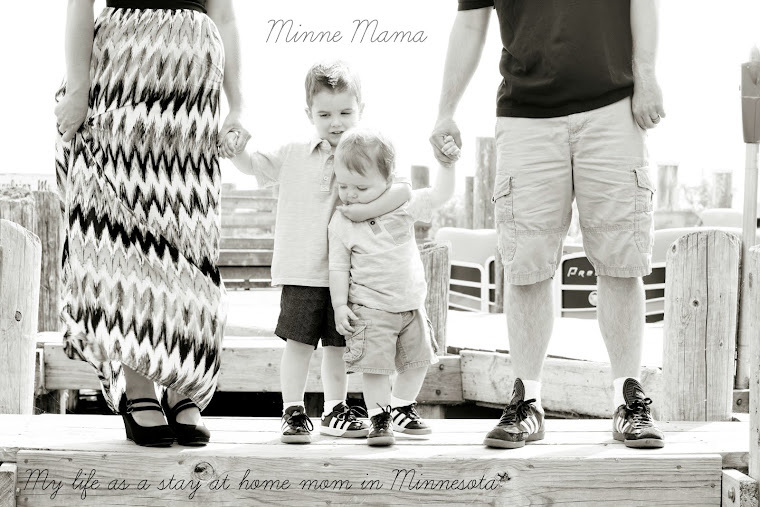 We always meet with friends, so I have some mama-talk time while Skyler enjoys running around and playing. Of course, my little book lover is all about the stories before play time begins! 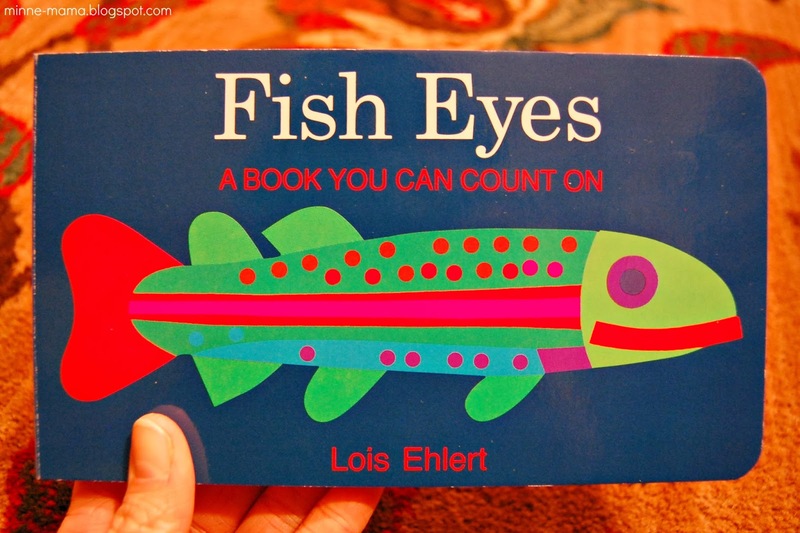 Last week, we read the book Fish Eyes by Lois Ehlert. It was new to me, and Skyler really seemed to enjoy it. 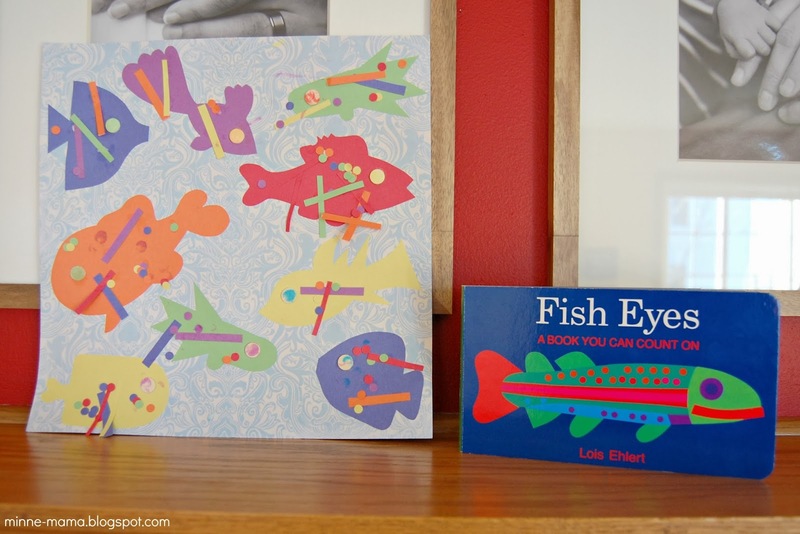 It is a counting book, has beautiful colors, and the eyes of the fish are cut outs so he can touch all of the holes as we count the fish (just like another favorite of ours, The Very Hungry Caterpillar, which was also the inspiration for our fine motor pipe cleaner caterpillar). I bought the book for Skyler soon after story time! As I have said before, I love children's literature. 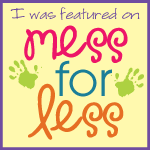 When I made lessons and student taught in college, I often tried to plan my lessons around books, as well as the lessons I created working in child care. 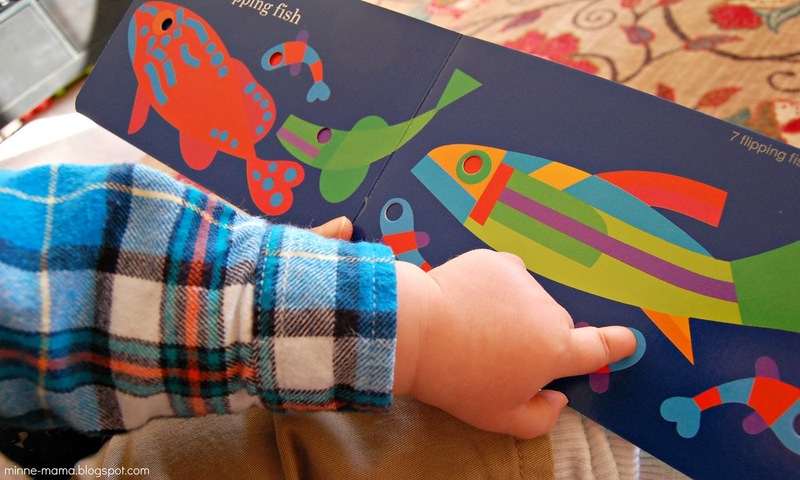 Now as a Mama, I always try to plan my activities around Skyler's current interests, and with his interest in this book, I knew it was a perfect way to incorporate this story with a fun activity. 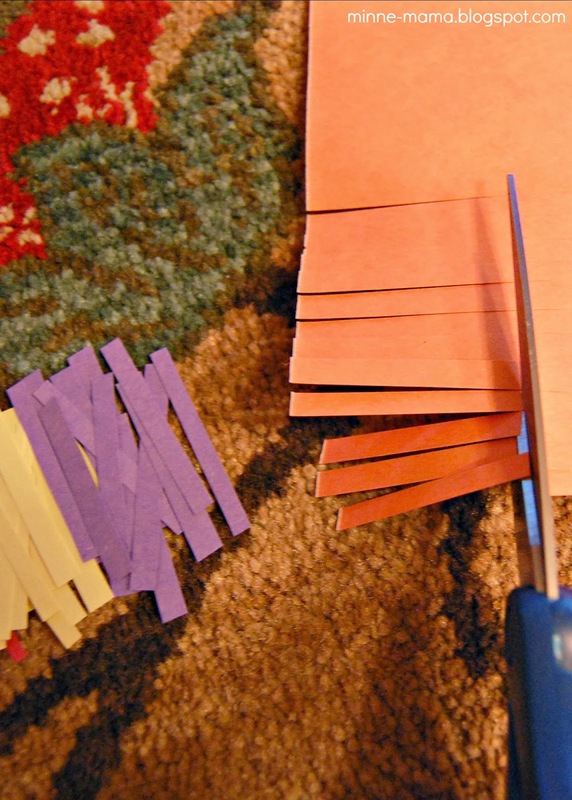 I wanted to make something with the small wooden rounds that came in the set we got for our color sorter (I used the medium size rounds for that), and this seemed like the perfect opportunity - instead of cut outs, our fish eyes are raised! 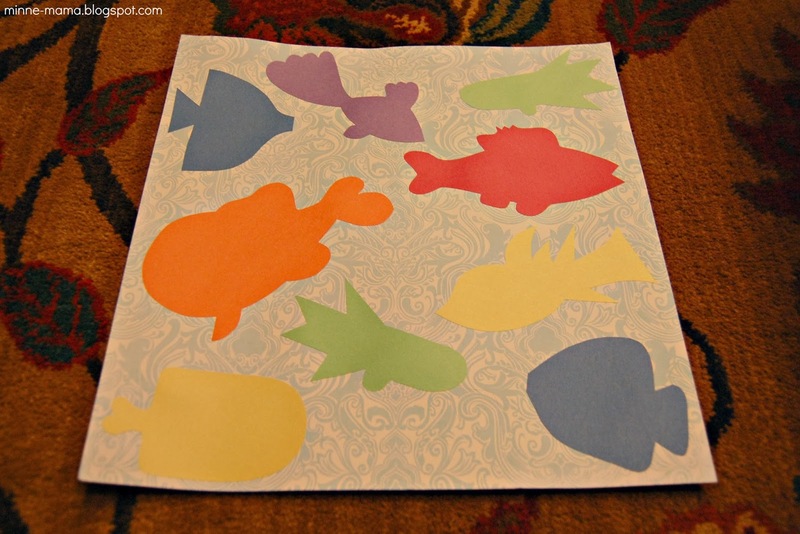 I started by flipping through the book and drawing out some fish shapes I saw on the different pages in different colors of construction paper. To simplify our fish, I didn't do different colors for the fins or tails, but kept them solid. 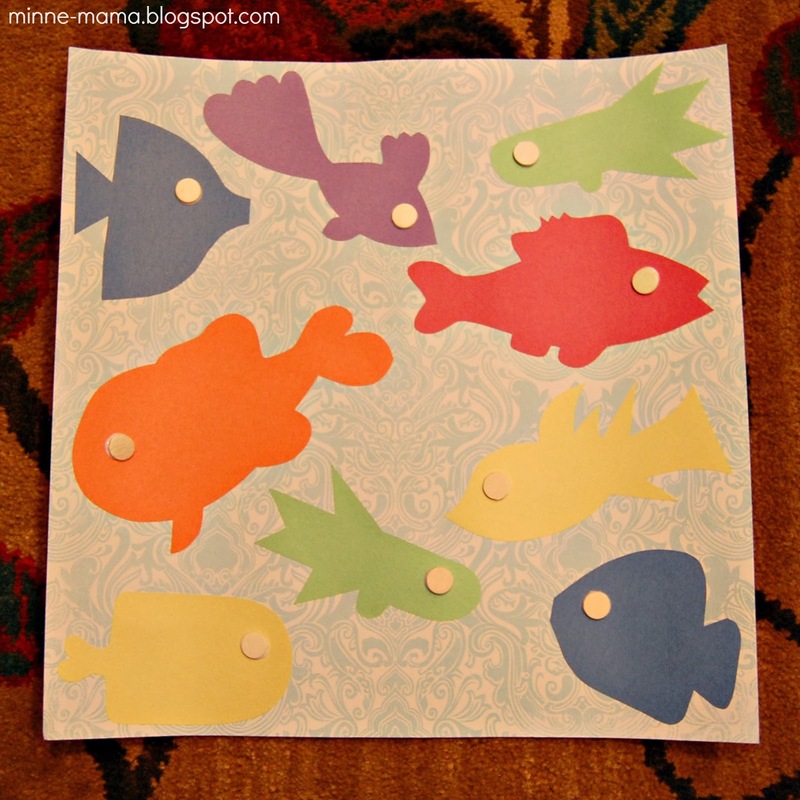 I glued the fish onto a pretty piece of blue scrapbook paper reminiscent of wavy water. The I added our raised wooden eyes. 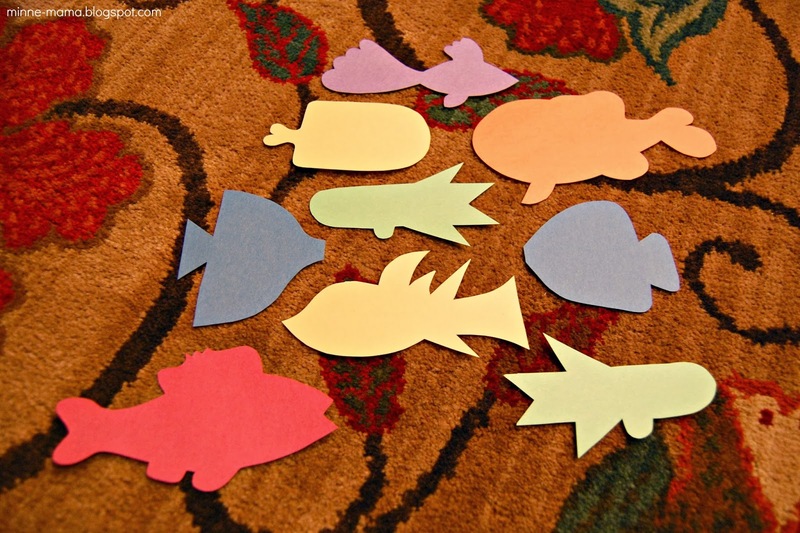 Many of the fish in the story are described as striped or spotted, so those are the decorations I made. I thought about using different materials like foam, but I settled with just using construction paper since it was already kind of busy. 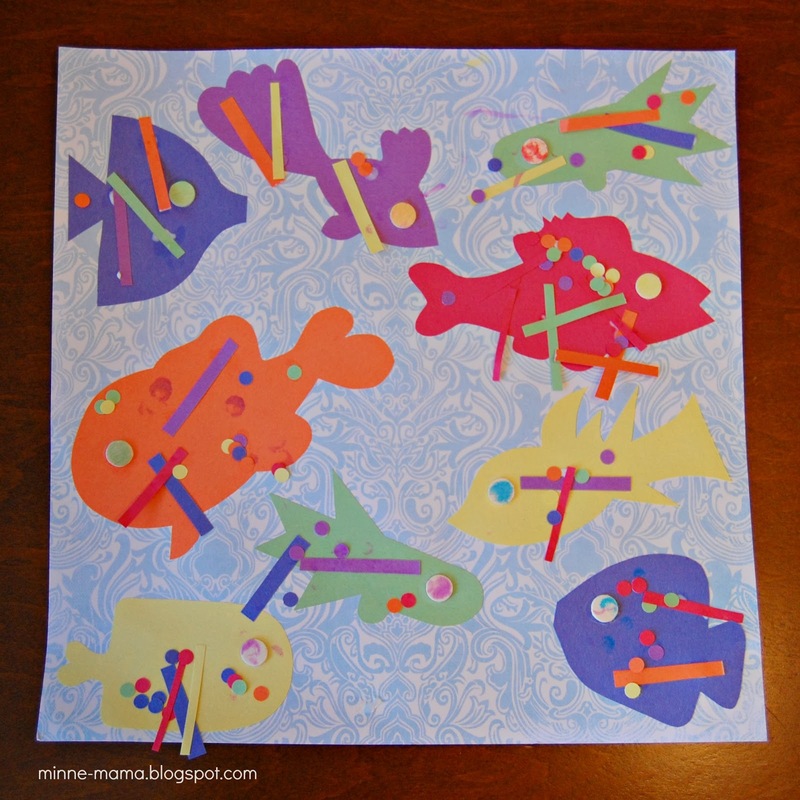 Creating the fish stripes and spots would be a perfect step for older children to do. 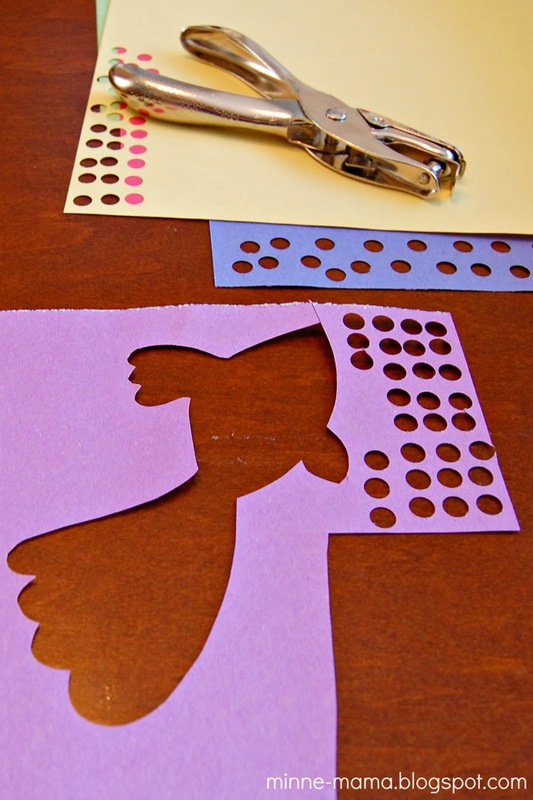 Skyler is a little young for cutting and hole punching, but children probably around three and up would have fun helping with this part (many other shapes could be created as well by cutting, using different shaped punches, stamps and ink pads or paint, or even just shape stickers). 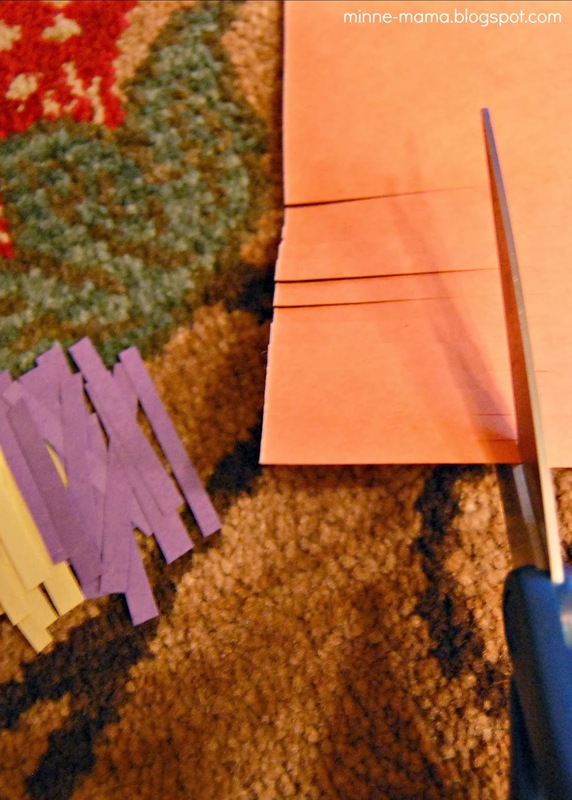 To create our stripes, I cut fringe and then snipped them off, and the spots were simply made with a hole punch. 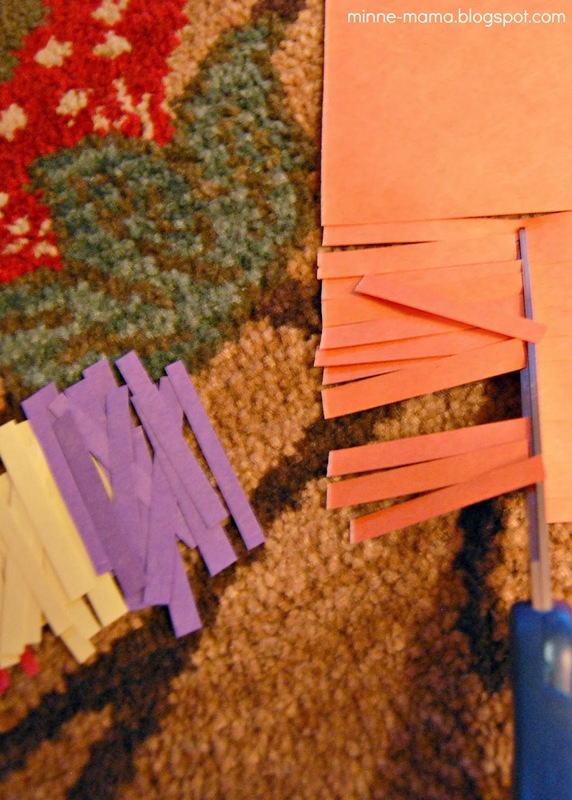 The holes made by the punch would look great cut off and glued onto a different color fish as 'scales' (like the red that can be seen through the yellow holes)! Maybe for another fishy activity. 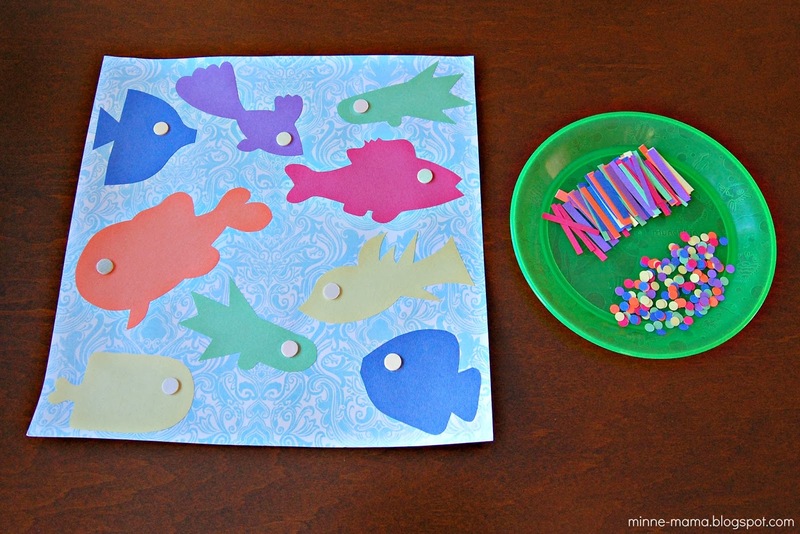 To decorate the fish, I put dots of glue on each fish while Skyler helped with his own glue bottle. 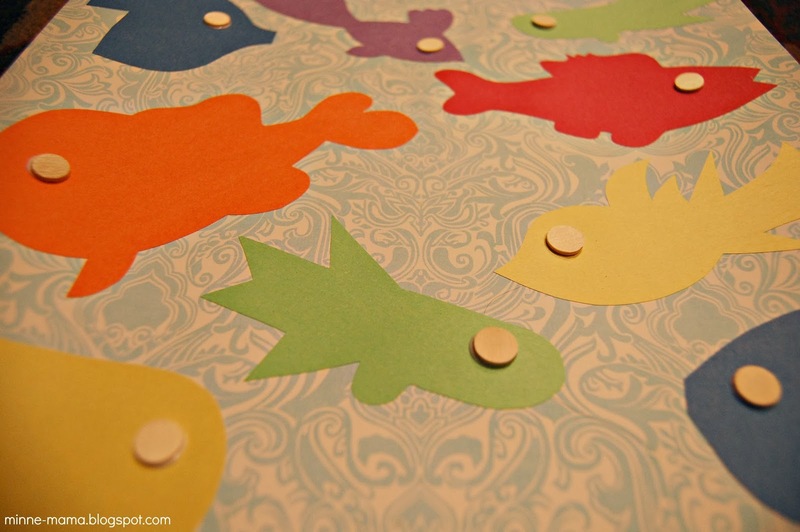 We started with one fish, and then I put glue on every fish and just sat back and watched him decorate. 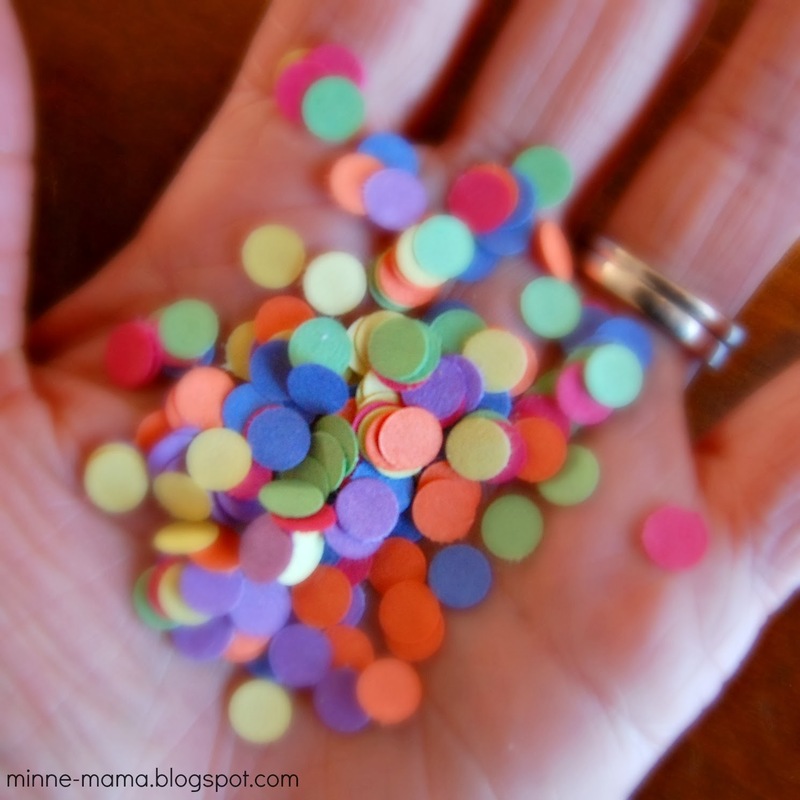 He did place some individual stripes and spots on the glue, but usually he picked up big handfuls and sprinkled it over the paper. 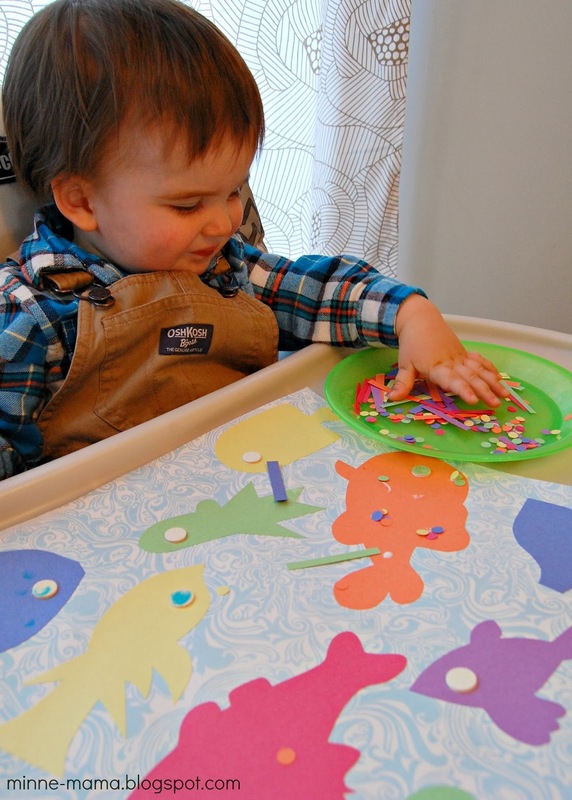 When we use glitter, we sprinkle it over the paper and then hold the paper up to knock it off, and that's exactly what Skyler did with the fish stripes and spots! We also pulled out our dot markers. 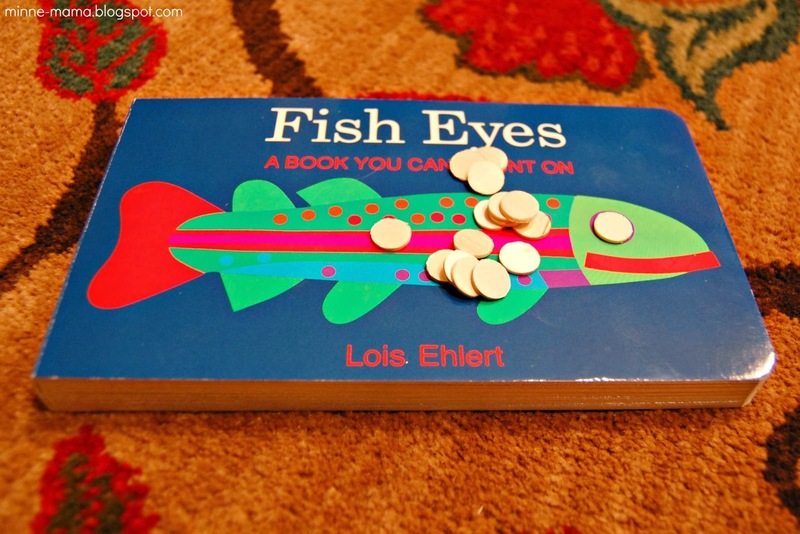 Skyler used them to color the fish eyes which I thought was so clever, since the fish in the book do have very colorful eyes! I took one smiley picture of my boy before putting down the camera to enjoy watching him work. 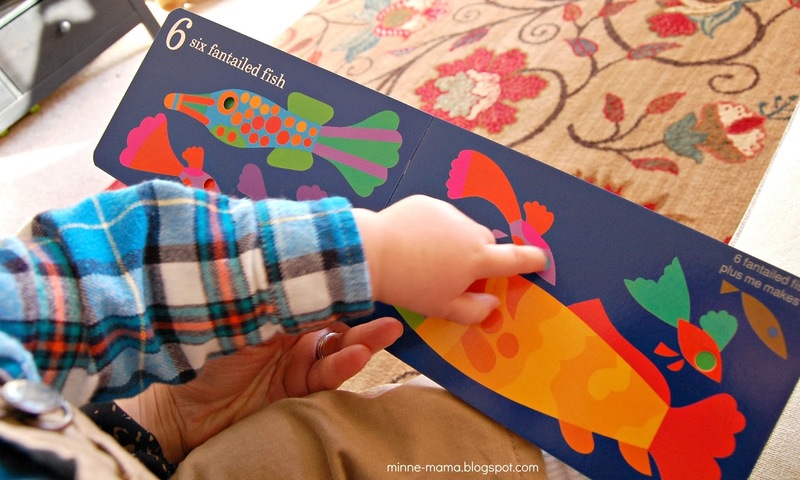 With Skyler's technique of sprinkling the paper stripes and spots around several times, his fish ended up very well adorned. I think this is a perfect craft to frame. Skyler was so proud of his work. I enjoyed watching him so much, and we had a great time talking about the colors and numbers as he went along. 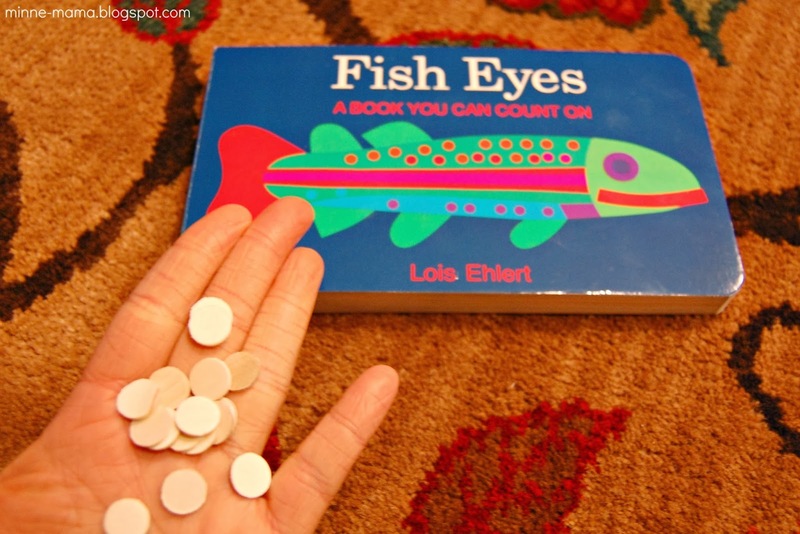 We talked about which colors we had one or two fish of and we talked about the bumpy eyes. I don't ever want to forget his happy squeals as he lifted the paper and watched the unstuck stripes and spots fall onto his tray, lap, and the floor, and his big toothy smiles as he looked at me. I don't want to forget how Skyler ran around and pointed to the spots on the floor saying "Purple!! Boo!!" as we went around and swept after. This is one to remember.